Quite many people ask us what is electronic certificate. They all know certificates, but what is the hype to turn everything into “electronic”? In the last week we answered that question so many times that we feel like it would help other people if we write the answers down and publish them. Electronic certificate is issued by you, using Retiffy, and is entirely digital. After issuing, it could be downloaded, printed and shared. It is customized to your organization and it is securely stored and accessed. 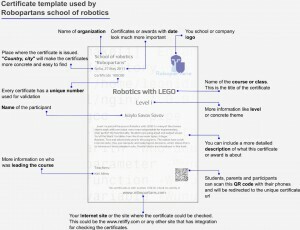 Below you can find a diagram (click to expand) of a real certificate used in School of robotics “Robopartans” (a premium partner). 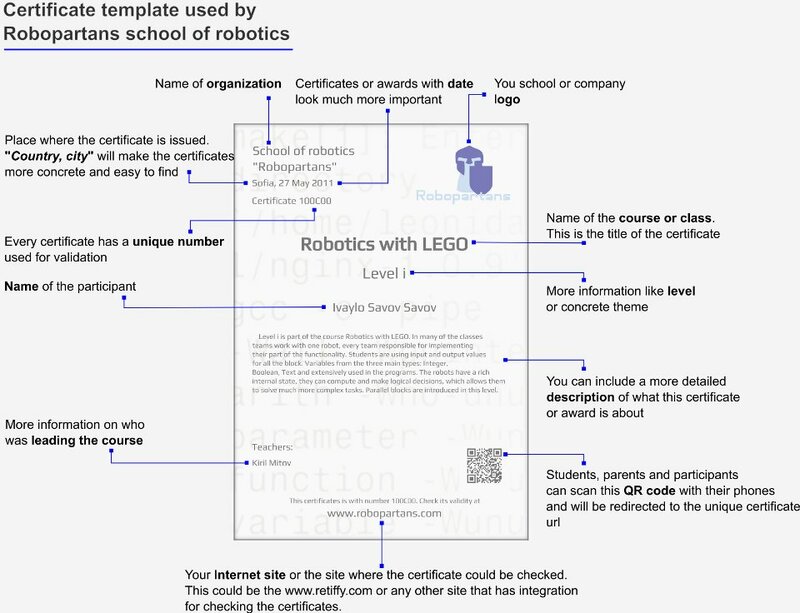 Since a certificate is available on the Internet search engines do index it and your organization would be found more easily in user searches. And your participants can easily build online portfolio with their achievemtns if they like to.